Join the Wake West student club to learn about great jobs, careers and companies in SF and Silicon Valley. Meet with and hear from alumni and parents who want to open doors and create connections for current Wake Forest students. OPCD career coaches will also provide tools, tips and resources to club members. 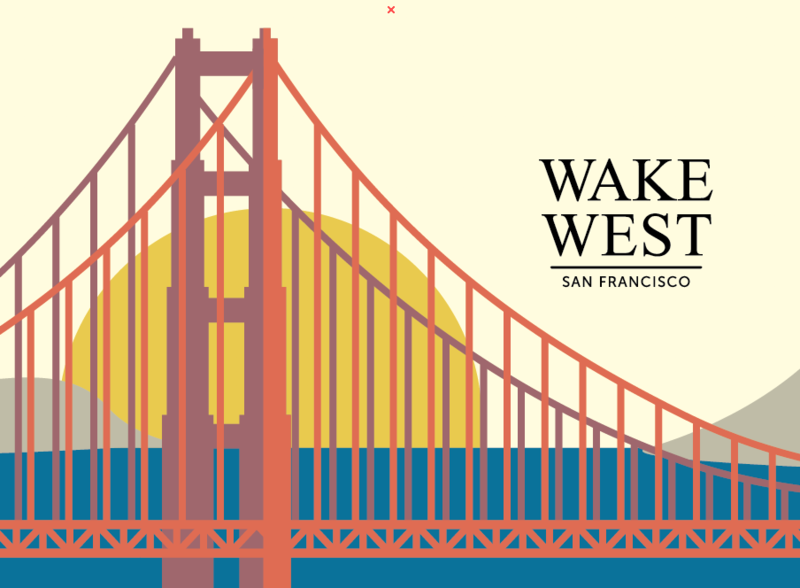 With thousands of Wake Forest alumni and parents in the SF Bay Area, we have created a private Wake West LinkedIn group of alumni and parents for professional connections with each other – and also for students. By gaining access to this group, you will be able to connect with SF Bay Area alums and parents who work at organizations like Uber, Google, Tilt, Salesforce, Oracle, Goldman Sachs, startups and others in a wide range of industries. Communicate professionally and succinctly in writing. Write a LinkedIn introduction message that you would use to connect with a member of the Wake West Group. Click this link for an example of a good LinkedIn introduction. Be sure it includes your first and last name, as well as your major. First Name Class Year-Wake West Introduction. Through your resume, effectively communicate your skills, experiences and capabilities, as well as how you can add value for an employer. To insure that your resume is outstanding, get your resume reviewed by walking in to the OPCD from 1:30-4:30 pm Monday-Thursday. Or use this resume rubric to self-evaluate your resume. Save your resume in your Handshake account > Documents; use the title, “Last Name. First Name Class Year-Wake West Resume”. Create a professional LinkedIn profile to connect with alumni and parents in the Wake West LinkedIn group and other alumni around the world. Click these links for a video on how to create a great LinkedIn profileand an example of a great WF student LinkedIn profile. If you are committed to working only in California, your professional photo can be taken in business casual attire. To insure that your LinkedIn profile is outstanding, get your LinkedIn profile reviewed by walking in to the OPCD from 1:30-4:30 pm Mon-Thu. Or use this LinkedIn profile rubric to conduct a self-evaluation. Shorten and personalize your LinkedIn URL with your last name. Then, save the shortcut link in your Handshake account > Documents; use the title, “Last Name. First Name Class Year-Wake West LinkedIn profile”. When you have completed the above three (3) requirements, please send an email to OPCD Career Coach Brian Mendenhall and inform him that your documents are complete and ready for review. Once your documents are approved, you will be given access to the Wake West LinkedIn group. You will be notified if your documents need to be improved prior to being given access. We will review your documents as quickly as possible. If you intend to work full-time in the SF Bay Area, you need to be prepared to spend time on the ground there to network and meet people in person. As Andy Chan says, “People hire people, not paper” – which is true everywhere, and especially in Silicon Valley. Many companies hire “just-in-time” – which means that they will start interviews less than 2 months prior to the start date; and they may not even post the job publicly. That’s why networking is crucial. If you’re thinking of taking a break this summer and starting work in the Fall, start your networking now so that you begin developing a good list of helpful contacts and gather information to help you when it’s time to interview for real job opportunities. Then launch your intensive networking after your return from your break so that you can start a job quickly, should they need you right away. So, make plans to spend time in the Bay Area, both before and after graduation, if possible. Be secure knowing that about 50% of Wake Forest graduates have jobs or are in graduate school at graduation; and that rises to almost 99% within 6 months after graduation. For summer jobs and internships, it’s possible to secure one as late as the middle or end of June. So consider spending time in the Bay Area after Spring semester ends to network your way into a job. You’ll considerably increase your odds than if you just apply to online job openings from campus or from your home. The SF Career Trek took place in January 2015. Next year’s trek will be planned for Spring semester 2016. To be informed, update your Handshake profile and indicate your interest in working in San Francisco. Please also join the Wake West student club, where students will be well informed about events and opportunities related to working in the SF Bay Area. For a personal consultation on your career plans and questions, make an appointment with an OPCD career coach.